Have I mentioned my love of robes on here before? 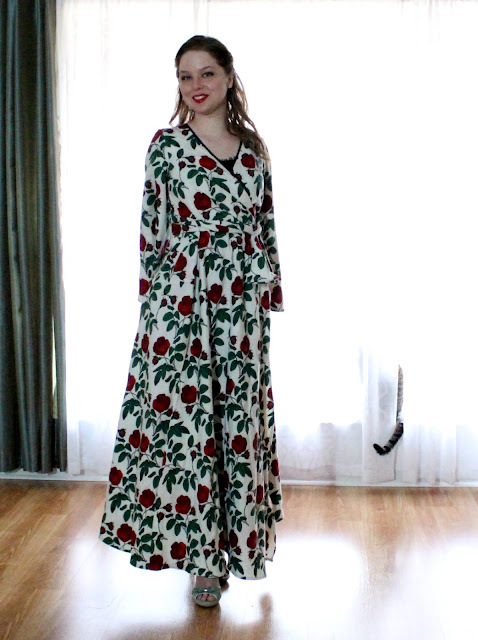 I think there's something incredibly romantic about walking around the house with a flowing gown trailing after you. 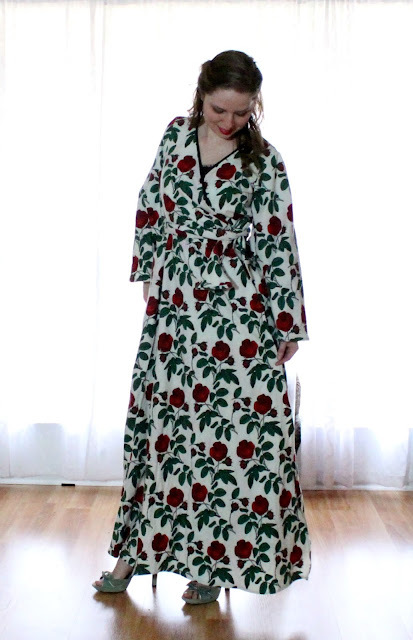 I don't know if i made a post about Downton Abbey and the robes on that show (and I'm too lazy to look), but I've wanted one ever since I saw the first season of that show! But robes were never really feasible when I lived in NYC. Now I live in a rather chilly house (thanks to central air and a low thermostat) so I figured what better time to make a robe than now?! 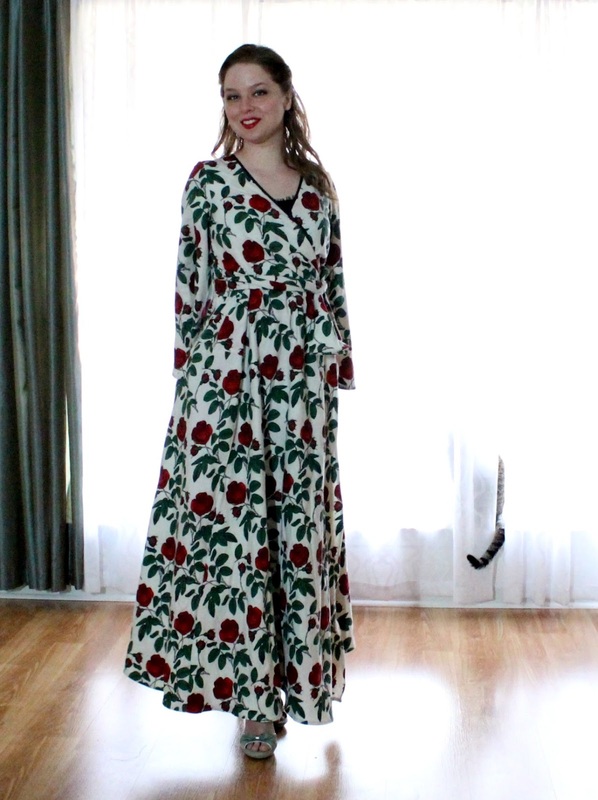 I first saw this pattern, Simplicity 8013 on Allie's blog, and I became obsessed, and I even made the poor sales girl at the store dig through boxes of patterns to find it in my size. It calls for 10 yards of fabric, by the way! 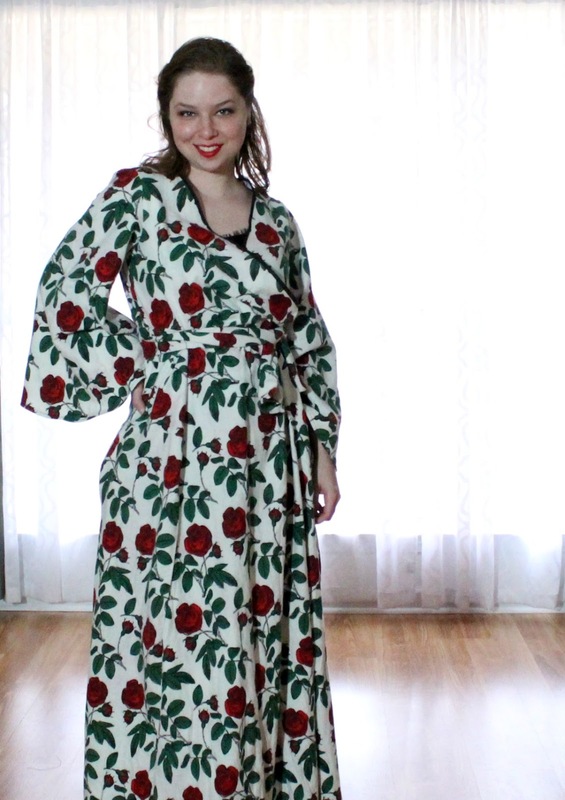 I decided to go for flannel fabric because it's not as bulky as fleece, and I decided to go for the roses because I'm currently obsessed with Once Upon a Time so it seemed close enough to the fairy tale world for me! The fabric was kind of an issue. I didn't want to order 10 yards because holy cow, that's a lot. So I tried ordering 8 yards, but then after 2 weeks, Joann's canceled the order and said they didn't have enough. 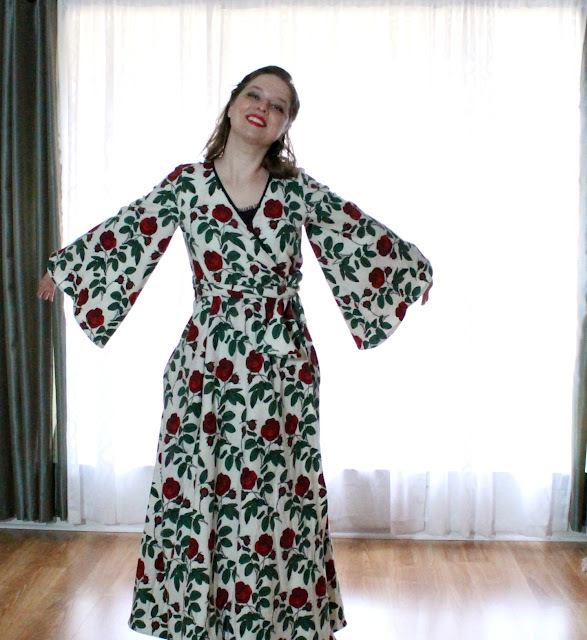 I re-ordered with 6 yards, and it came a few weeks later, and it's perfect and wonderful. Except it wasn't enough. Especially since it's a patterned fabric. Oops. I probably would have gone back to buy more if I bought it at a fabric store, but ordering fabric online is SUCH a hassle that I decided to make it work. Obviously I converted this into a robe so it opens in the front. No zipper. I added darts in the back bodice to bring in the shoulders a bit. I only cut out the back skirt, the front skirt, and one side skirt, which I then cut in half, so the skirt is not as full as it should be. Additionally, there was no room to gather the back skirt so it's a bit flat, but I think it looks fine. I put bias tape around the bodice instead of lining it. The length, somehow is perfect. The sleeves, also somehow, are perfect. The top is a little large, though I knew it would be from the pictures. I might try to add a bit of coverage there (if this weren't a robe, of course). I cannot wait to sew up something else with this pattern (and maybe get the yardage correct!). Love your version! I would gladly glide out to get the paper every morning in this robe or even order Chinese in so that I could answer the door! Great job! So pretty! 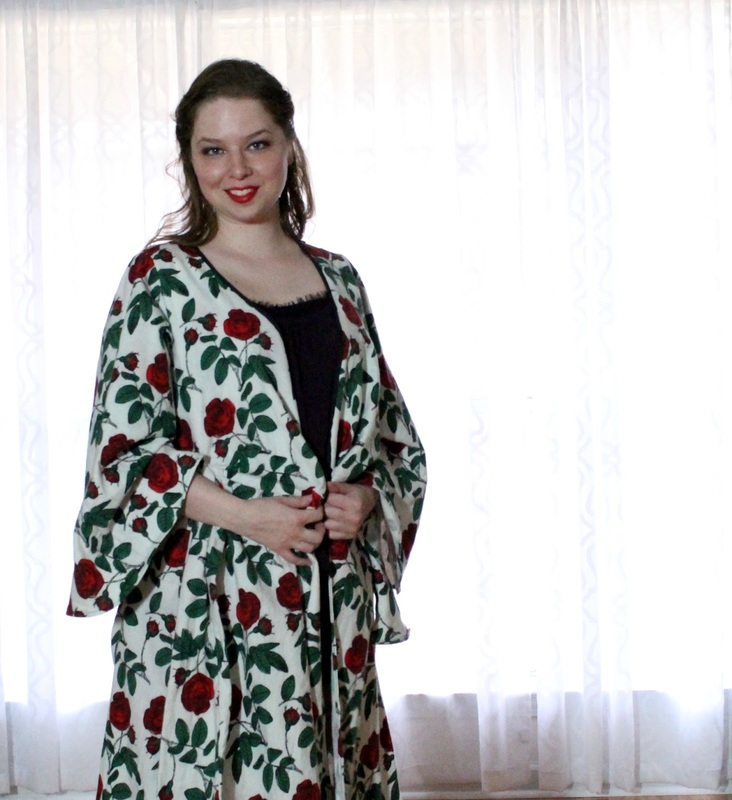 This is a beautiful robe, what a great use of the pattern. Oh my gosh this is BRILLIANT! 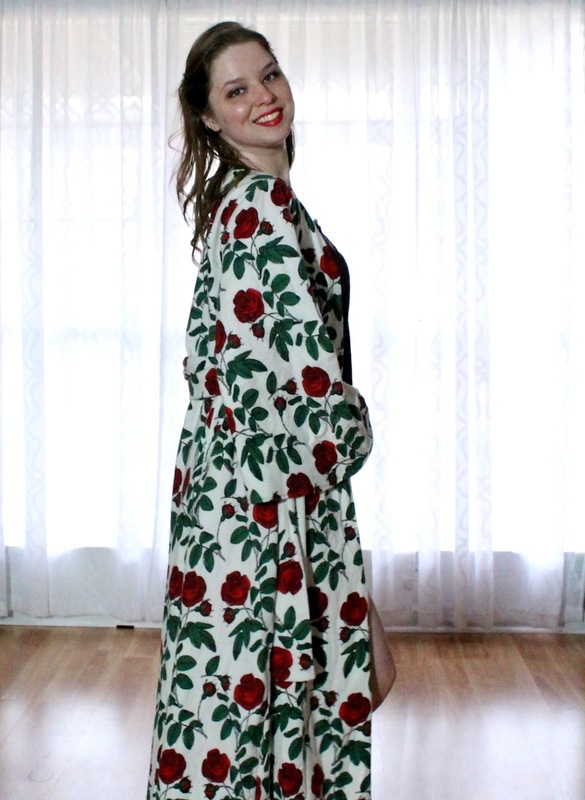 I never would have thought to make it into a robe!!! So glam!